Art is my profession; music is my passion. Art and music are two creative pursuits that define my life. I realize that I didn’t include writing. I’ll save that for another story, because writing is definitely my remedy! There are many similarities between art and music for me. I believe the most obvious parallel between art and music would be “layers.” Every illustration I create starts with layers. The order, selection and placement of those layers affect the outcome. When painting with watercolors, my washes are transparent veils of colors that I gradually build upon. I am now primarily a digital illustrator. I separate every item in the composition on my computer. Then I arrange those items to fit comfortably into the label area I’m illustrating. I use whatever reference I can find and often shoot my own photos with an inexpensive digital camera. Below is an example of my digital process. 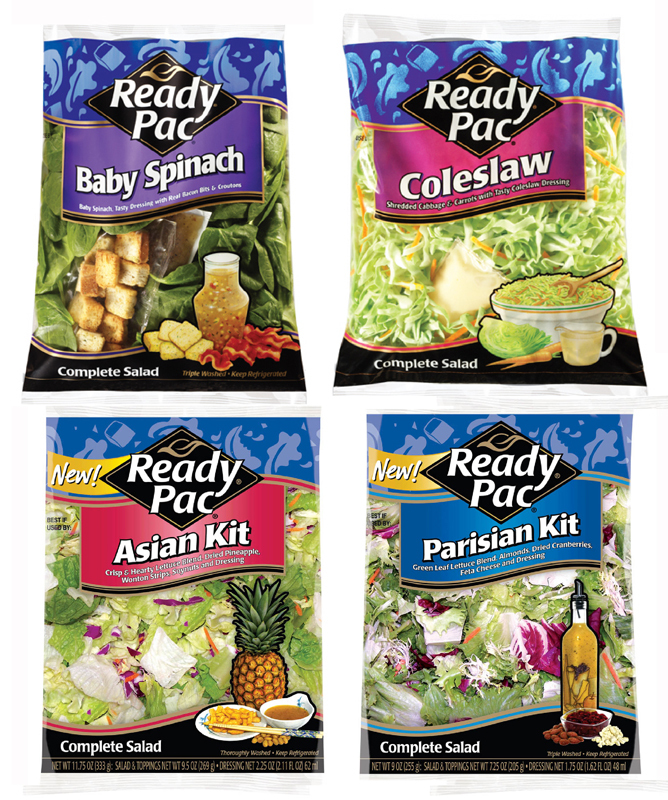 I was still teaching myself how to do this when I illustrated a label for the salad company, Ready Pac. 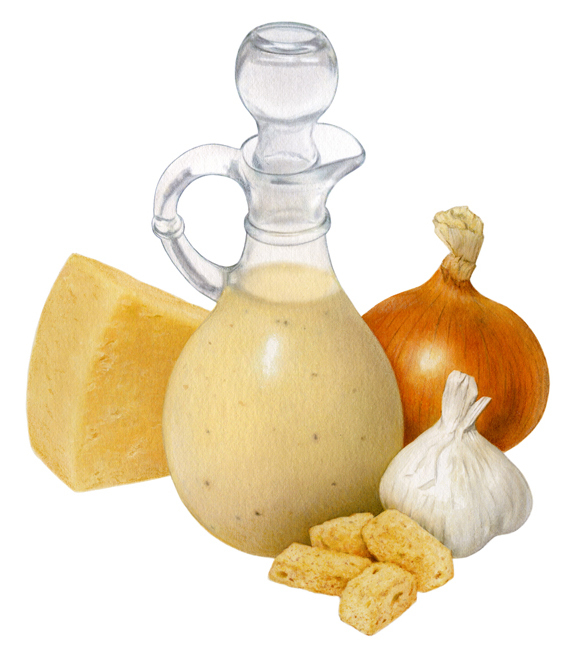 My illustration was for a Caesar salad dressing label and the ingredients needed to be arranged in a specific way to fit the space. My final illustration (the lemon was taken out). With music, the ingredients are the lyrics, chords and my vocal – all of which are deeply defined by me. And with every song creation, the order that I create those ingredients is different. 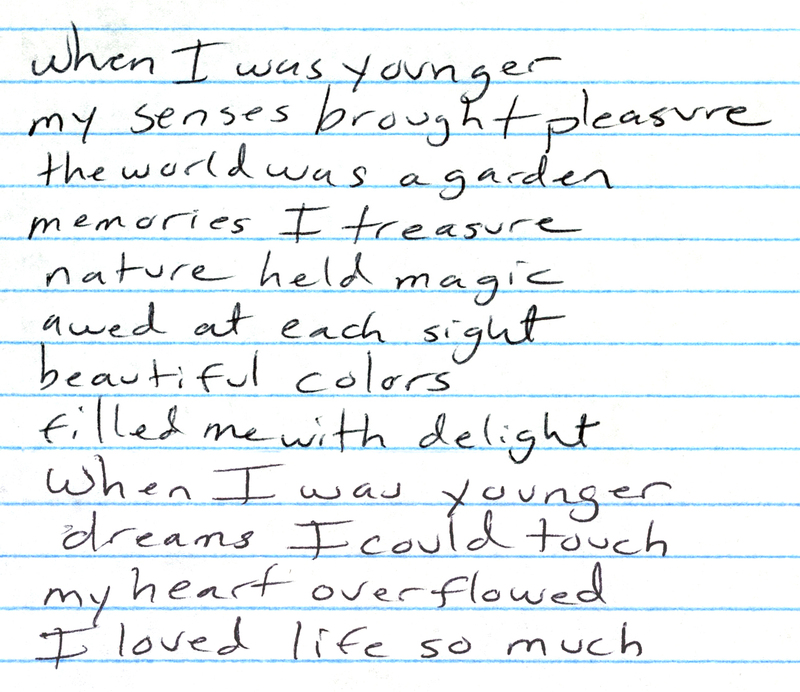 Sometimes I’ll scribble lyrics on a scrap of paper in my purse. Late at night, I might discover beautiful chords while playing my guitar. Other times, I’ll hum a melody that I can’t shake. Music has layers, just as an illustration does. Clearly defined layers comprise my song’s arrangement. Arrangements are simply layers (or separate tracks) of instrumentation and include my vocal and guitar recordings. George has also told me that the order of an instrument we choose affects the entire arrangement. He has told me he plays different melodies, which dance in harmony to the sound that came before it. That is exactly like the creation of a watercolor painting when I must decide which areas to paint first. Music layers are visible as colored stripes on the computer program Pro Tools. I have learned to read and edit waveforms. 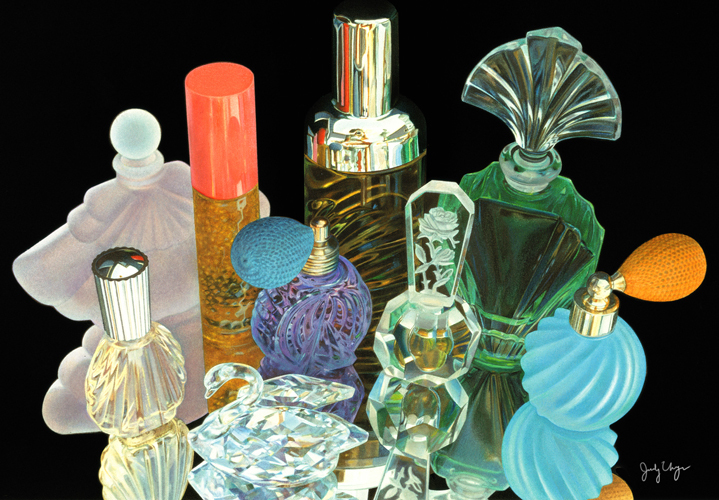 With art, I strive relentlessly to please my clients and that can involve numerous revisions to an illustration. With music, I strive to please myself. There is even a similarity between those because it is a relentless task. I am very demanding of myself! It occurs to me that I haven’t written anything really funny for a long time. 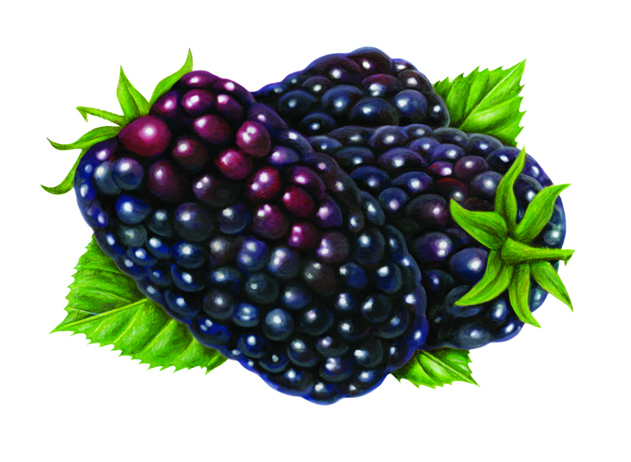 My final illustration of Marion Berries. The client was very particular about the color of this berry. 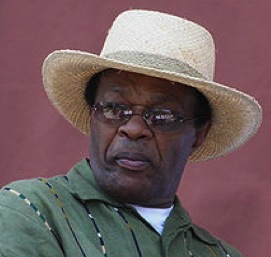 Close, but this is Marion Barry…. I far prefer illustrating a pepper like this one. These peppers are a lot prettier than the story I am going to share below! Sometimes on illustration assignments I am required to sign confidentiality agreements. Even though I haven’t had to on my recent projects, in the interest of being discreet I won’t name the clients I’m working for. I have learned a lot as an illustrator. I received a small assignment to create two illustrations to go on a pizza box. One was for garlic and the other chipotle. 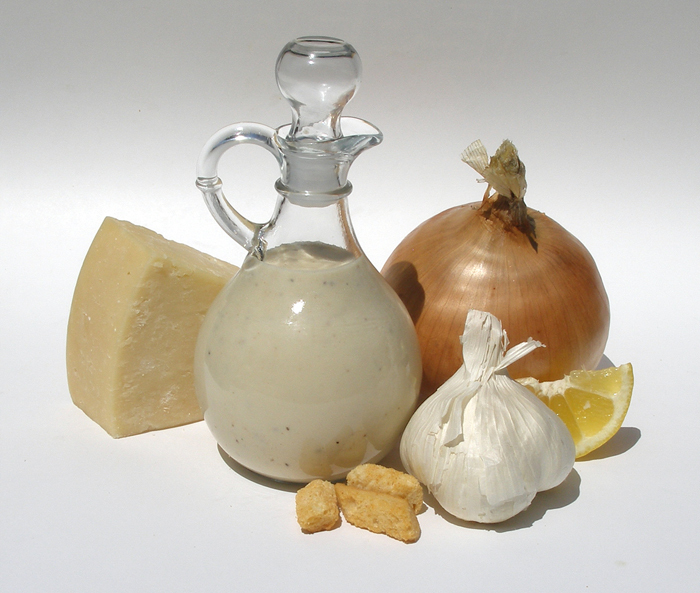 For the garlic flavor, I already had existing art that could be used. But for the chipotle flavor I had to create new art. Rarely is that required of me, since I have such an extensive library of existing food images. So now, I am intimately acquainted with Chipotle peppers. They were a lot harder to illustrate than I thought. It was because they were incredibly ugly and no actual reference existed! Every job of mine begins with finding reference. 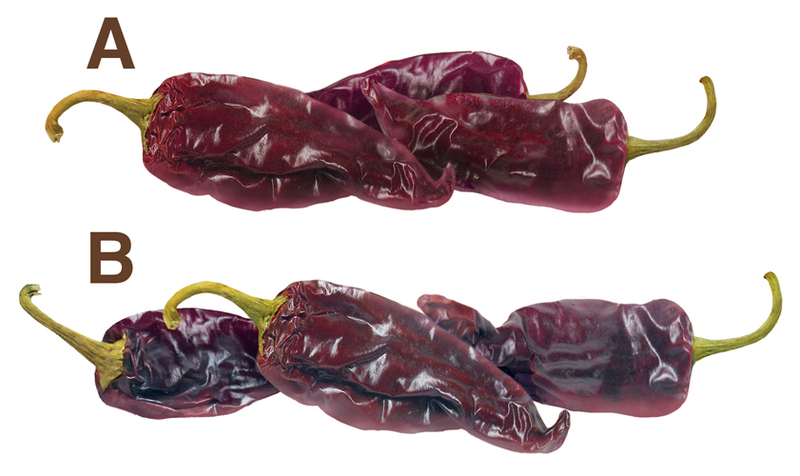 I contacted the art director after going to a local Hispanic market looking for an example of chipotle peppers. I told her that I couldn’t find any actual peppers to work from. It seemed that they only existed as a picture on a can. And inside the can, those peppers were soaked in Adobo sauce. I needed something better than that to work from. 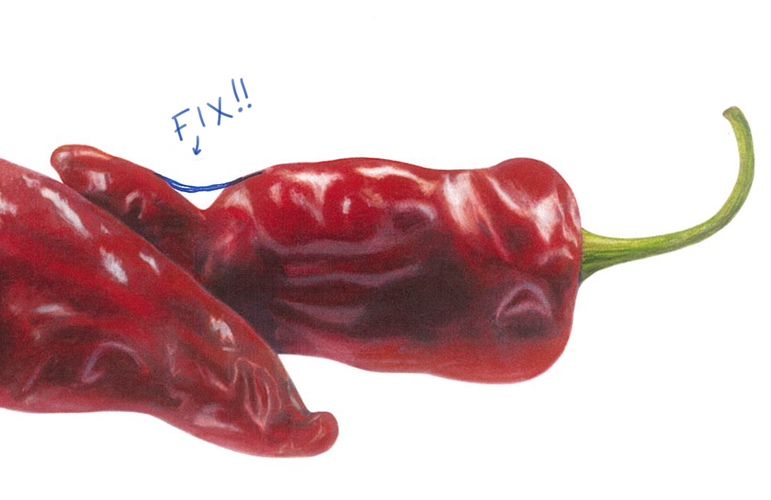 I couldn’t believe it – how in the world would I illustrate peppers looking like that? It was time for me to be truly creative. I remembered seeing dried peppers at the Latino market. I would just go back and find something “similar.” I must mention that I was also searching for reference on another assignment. I needed items of caramel, chocolate and ice cream. For a few weeks I became a supermarket sleuth! My dining room table was covered with illustration reference. Unfortunately, the peppers I found did not really match the shape or color. Some were very tiny, long and a bright red color. Others were longer, wider and brown in color. I altered my photos and tried to match the photo of pepper corpses above. I then shot them off to the Art Director, whom I will call AD. AD sent me back more photo reference. Aha! Now I was on the right track! Once again, I went back to the Hispanic Market and went through all the bins of dried peppers while holding a color copy of those images above. The penny was helpful for size, but there was still nothing that matched. But I knew with Photoshop I could do wonders. As I was walking toward the checkout line, there was another bin. Wallah! There were peppers that really seemed close to what AD wanted. Hint: They were not Chipotle. 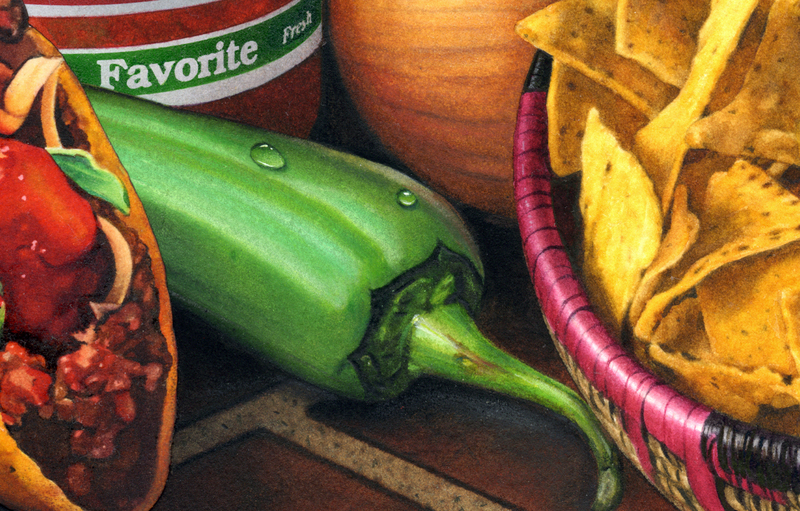 I began my digital work and delicately erased the background and arranged the peppers into different compositions. I sent my layout choices off to the AD. The AD picked B. But now, the color had changed. Brown or eggplant color was out and I was instructed to create something with a deep red. I created another layout on my computer. My layout was approved! I felt like I saw peppers in my sleep by now. My eyes burned because I rubbed them by mistake while I was photographing the dried peppers. I forgot how potent those peppers were! The process of creating my illustration was usually simple at this point. I printed out my image onto watercolor paper and worked over it. I used a lot of colored pencil, especially on the highlight areas that were numerous and too busy. Sometimes my illustrations feel very abstract when viewed as a close-up. I sent off the final art and it was a relief. I always looked forward to the message telling me my artwork was approved and that I could send an invoice. I held my breath. THANK YOU SO MUCH again for jumping on this! Shoot over your invoice and I’ll get it into accounting right away. Yippeee! 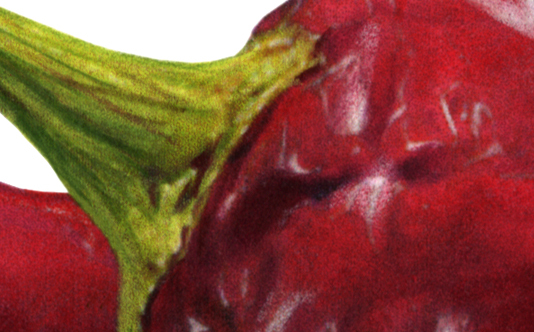 After illustrating peppers, I feel like I’m hot stuff. 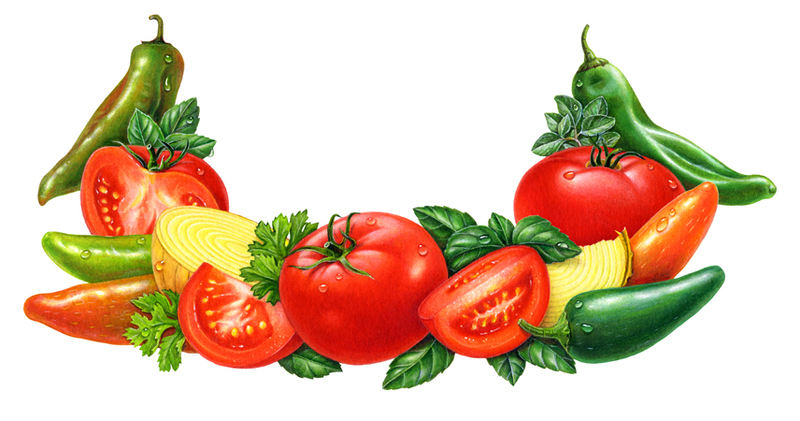 This entry was posted in Uncategorized and tagged acoustic guitar, arranging a song, artist, Caesar Salad illustration, capsicum, chipotle peppers, commercial artist, composing, creativity, digital art, digital illustration, food illustration, garlic illustrations, guitar, Humor, humor daily life, illustrating, illustrating food, illustrating in layers, Illustration, illustrator, inspiration, Judy Unger, Music, music as layers, musical arrangements, musical arranging, original songs, Peppers, Perfume medley, Ready Pac, songwriting, watercolors, writing. Bookmark the permalink.